CERTIFIED 1 TEXAS OWNER -- BLUETOOTH -- POWER EQUIPMENT -- CLEAN CARFAX! 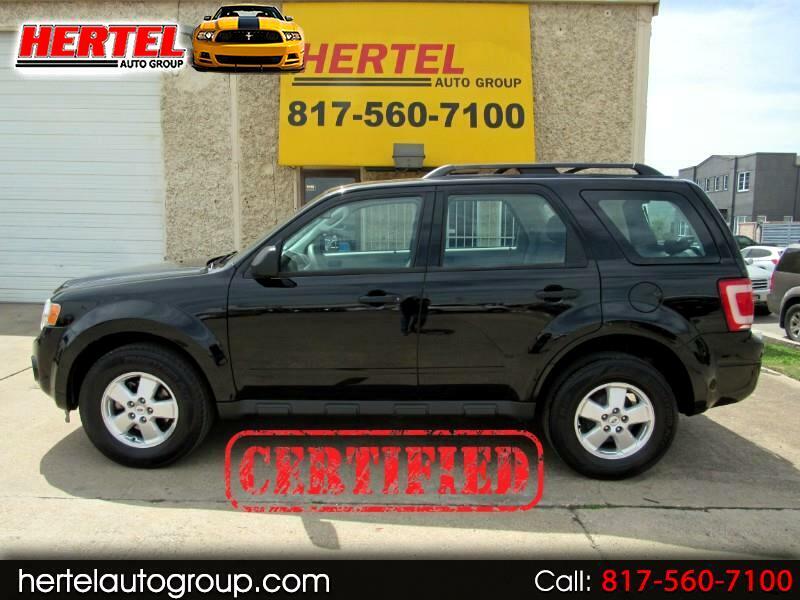 Hertel Auto Group is pleased to offer this good-looking, frugal and suprisingly fun-to-drive 2012 Ford Escape XLS FWD SUV for Sale in Fort Worth Texas. Bought brand new from Sewell Ford out of Odessa Texas in March of 2012, this fuel-efficent compact Sport Ute was probably owned by a college student as it made its way back and forth between Lubbock and Carrollton for the length of its ownership. One glance at it will tell you that it was well cared for and appreciated. If you've been looking for a great vehicle for a new driver; a more fuel efficient daily commuter; or as an upgrade in space and versatility for a growing family, this Escape would be a great choice. Whatever your reason for considering it, you won't be disappointed. It's that time of year again when a fresh crop of new drivers are needing first cars and this would make a great choice. Ford has sold a kajillion of these Escapes, so they've definitely gotten it right over the years. This would also make a great ride for someone heading off to college in the Fall; or as an upgrade in cargo and people carrying capacity for a growing family. Whatever your reason for choosing it, you're going to be getting an economical, easy-to-own, easy-to-drive sporty little compact SUV at a great price! Completely redesigned for the 2008 model year, the widely-popular Ford Escape gained new sheet metal that mimicked the look of newer and recently redesigned Ford models of the time (such as the Edge and Expedition) and a more attractive and functional cabin that included the first use of recycled materials for a vehicle's upholstery. Safety was also addressed, as antilock brakes, a tire-pressure monitor, traction control, stability control, front-seat side airbags and full-length head curtain airbags with a rollover sensor became standard equipment. On the road, this sweet little Escape is powered by a peppy 2.3-Liter 4-cylinder engine that had original factory specifications of 153 horsepower while still returning up to 28 mpg on the highway. Mechanically, it starts, runs, drives and shifts just like you'd expect a low-mileage vehicle to perform, and it is a breeze to drive and park in more urban settings. All four 235/70R16 tires mounted on OEM 16" Alloy Wheels are in fair to good condition. On the outside, this Escape's rust-free exterior sports a beautiful Deep Black Paint Scheme that is complimented by a Tan Cloth interior. Of note are some minor hail dings on the hood (see pictures) Inside, the smoke-free interior of this Escape compact SUV is nicely equipped with Bluetooth; Steering Wheel Audio Controls; Microsoft Sync; Keyless Entry; Power Windows & Locks; Cruise Control; Cold A/C; An AUX Port; and a nice-sounding factory audio system. As with any pre-owned vehicle, it does have the usual amount of cosmetic imperfections that are inherent to a vehicle of this age and mileage. We invite you to view all of the photos that are available on our Web Site and determine for yourself if it meets your expectations for a vehicle of this age and price. If it does, we then welcome you to stop by for a viewing and test-drive of this sharp-looking 2012 Ford Escape XLS FWD SUV. Based on its mileage, equipment, condition and history, we've priced it well below current market values and expect it to sell quickly. Don't let it pass you by! Certified Plus Coverage includes major components of the Engine and Transmission, as well as A/C Compressor; A/C Condenser; A/C Evaporator; Radiator; Water Pump; Thermostat; Alternator; Starter Motor; Power Steering Pump; and more. Service Work can be done at any Ford Dealership or ASE-Certified Mechanic. See Dealer for More Details & Upgraded Coverage Options!